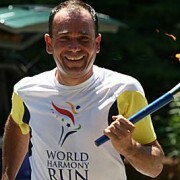 Sometimes training to run an ultramarathon makes you do crazy things. Like running 26.2 miles, alone and unaided, for a training run. Most of the time I like to do my long runs on trails, but this past March they were still all closed up in snow. I searched deep into out local treasure-trove of trails, WenatcheeOutdoors.org, but again, most of the routes listed under “Trail Running” still weren’t accessible (or at least I didn’t want to spend 4+ hours wading through snow). Then I wondered if it would be possible to follow another path, maybe one carved out by followers of another sport? I had heard that road bikers could get to Leavenworth and back without getting on Highway 2, so I started with that. I soon realized that the logistics of needing a ride to or from Leavenworth wouldn’t sync with my kid’s nap schedule and so a point-to-point run from Leavenworth to Wenatchee wasn’t in the cards. But that’s when I found the Wenatchee-Cashmere Loop. I rose excited that early Saturday morning on March 10, ate a small breakfast and headed out to my start point at Riverfront Park. It was still a little crisp when I started, which bode well for a perfect running day. 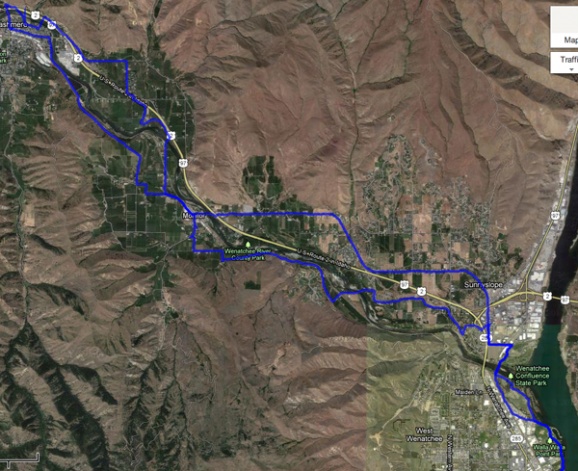 My run started on the cornerstone of our local running routes — the Apple Capital Recreation Loop Trail in Wenatchee. The Loop is like an old pair of jeans — always there when you need it, always ready to be used, but never upset if you decide to venture out to and choose something else. Its hills make it not too easy; its views give it a subtle majesticness; and its location makes it the perfect meeting place. 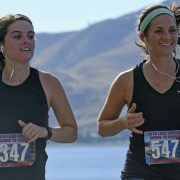 Even if the Loop was all Wenatchee had to offer runners, it would be enough. Heading out towards Monitor, I followed Easy Street for an extended stretch. The road was pretty banked and I quickly started noticing a pain on the inside of my shin. It had bothered me before but only when I was running on a slightly-sloped street. I had neglected to realize that most of this long trip would be on streets that were subtly banked. The pain was dull and not insistent, however, and in the end I was thankful for it as it kept other pains unnoticed. My trip out through the north end of Wenatchee was lovely: great views, quiet streets and rolling terrain. Simply put, a beautiful spring morning just made for running from one town to another. 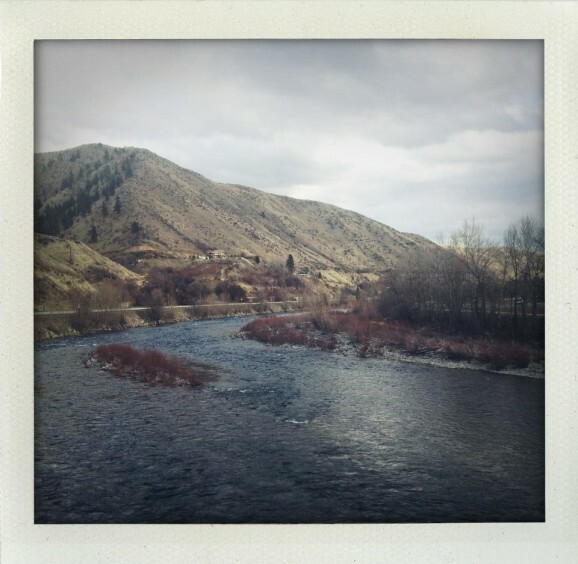 I passed through Monitor feeling great and had beautiful views of the Wenatchee River and the surrounding foothills. I was running up Old Monitor Way when I crossed the Wenatchee River and got to Anjou Bakery. WenatcheeOutdoors mentions this as a popular spot for bikers to stop and get a snack, but I didn’t think coffee and pastry would do me well in the middle of a long run. I kept proceeding to what was probably the most dangerous part of the entire run, crossing Highway 2. Thankfully my crossing went very easily, but this is a place where you need to exercise extreme caution. 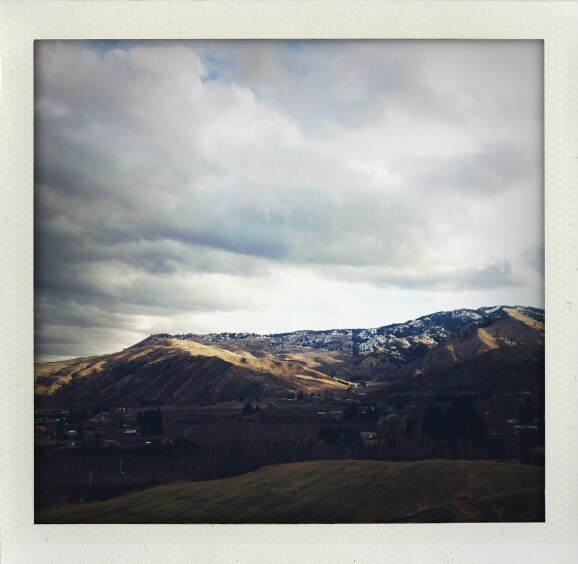 On the other side of the highway the gorgeous foothills of Cashmere filled my view. My route took me straight through the picturesque downtown, and I paused for a sit and a Clif bar along the banks of the Wenatchee. Afterwards I tried listening to a podcast, but even on long runs (or maybe especially on long runs), you need something to keep you moving, so my playlist of running music came back on. 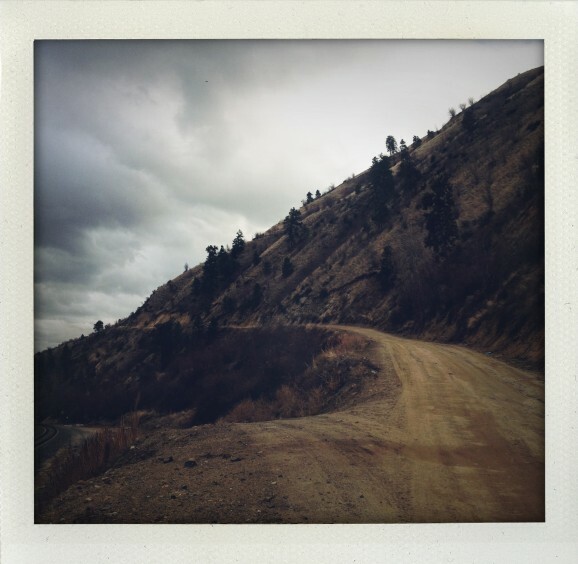 Less than a mile outside of Cashmere is the one time this course takes you off-pavement. Kelly Road turns into a dirt road for about a mile and winds up onto a hill to give you a great view of the surrounding orchards. I was relishing the departure from asphalt until I saw a big dog standing in the middle of the road. He growled and barked a few times, then ran up and licked my nervous hands. When I started a slow jog again, keeping an eye on him, he bounded next to me, my new enthusiastic training partner. A few steps farther on and he was called back home by a cranky owner. As I left Cashmere and ran back through Monitor the expected deadening of the legs started to set in, I was nearing 20 miles and the Wall. 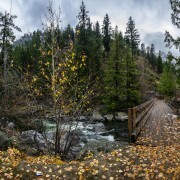 After crossing the Wenatchee River again on Sleepy Hollow Road, Lower Sunnyslope Road seemed to take forever to get me back to the Loop Trail. The scenery was still gorgeous though; I was now running through all the orchards I had seen from the top of the hill on Kelly Road. At last I entered the home stretch. The Loop Trail welcomed me like that old pair of jeans, and I floated the last three miles in familiarity. I love exploring new places and new trails, but there’s something about running your habitual trails that makes them seem shorter and easier. I got back to my car at Fifth Street just as the sky was purpling. I lay in the grass, feeling tremendously better than I did the first time I ran a marathon (when I literally collapsed into a volunteer’s arms a step past the finish line). As I lay on my back and tried to stretch out my quivering legs I saw the sky through the trees and felt as I often do after a long run — that all was right with the world. I also had to chuckle at myself. I had just run a marathon for a training run. But like I said — training for an ultramarathon will make you do crazy things. Brad Fitzgerald is an East Wenatchee long-distance runner. When he isn’t running, he is designing websites — also one step at a time.